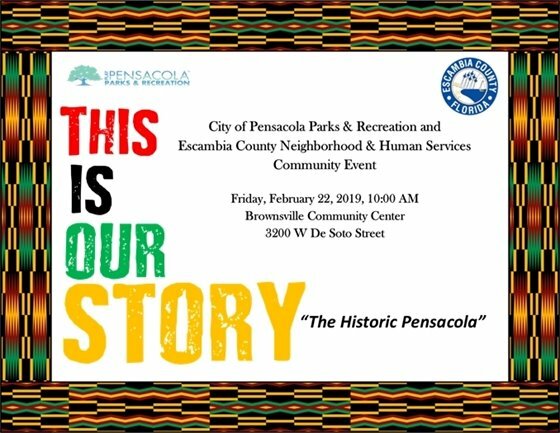 The City of Pensacola Parks and Recreation Department and Escambia County Neighborhood & Human Services Department are partnering to present and African-American History Month event for seniors age 50 and up on Friday, Feb. 22 from 10 a.m. to 1 p.m. at Brownsville Community Center, 3200 W. De Soto St. The event is called "This Is Our Story" and will include musical performances, spoken word, guest speakers, health screenings and light refreshments. Guest Speakers include Rev. Donald Harris, Bennie Washington, and Dr. Marion Williams. A collection of artwork by local African-American artist Erik O'Neal titled "Recreating the Moment" will also be on display. For more information visit PlayPensacola.com or call (850) 436-5195.